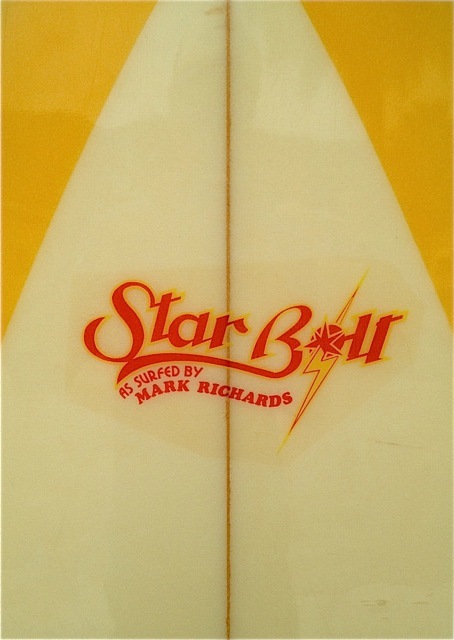 MR on Star Bolt twin fin at Burleigh Heads. Photo from Surfing World. My guess would be that this board was shaped by MR himself. So who got the royalty? The Lightning Bolt surfboard label that existed in the 70's in Hawaii operated differently to any other surfboard brand that I am aware of. Unlike other labels where the shapers name was the brand name, Lightning Bolt operated more as a co-operative, allowing a huge number of shapers to make boards bearing the iconic Lightning Bolt trademark. 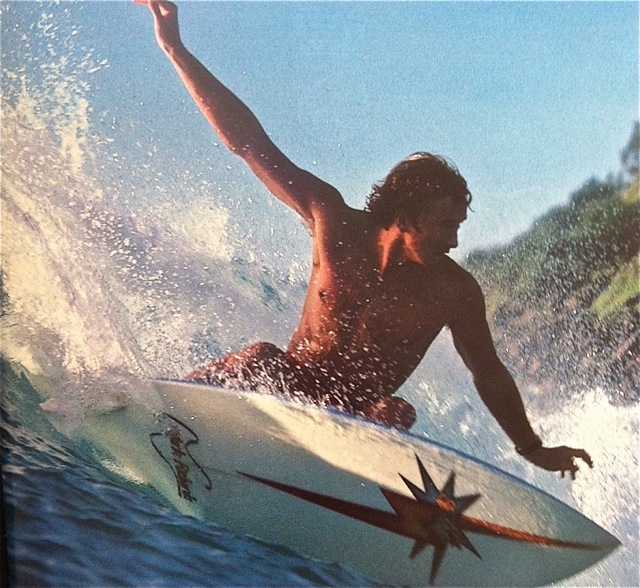 This makes good business sense when all the boards were sold through the one shop, as they originally were in Honolulu. 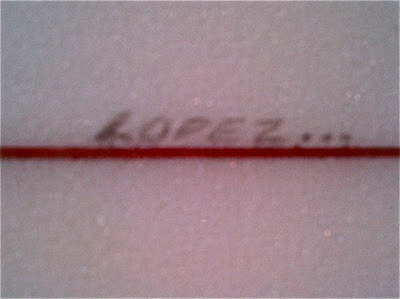 When the shapers would finish a board they would drop it into the shop on consignment and when it sold the shop, acting as the custodian of the trademark, would make a cut and the shaper would make a cut. This system had a lot to do with why they label became so strong, as they were able to offer free boards to almost every traveling pro that showed up in Hawaii in 70's at little cost to themselves. Having every pro on the north shore on Bolts guaranteed the label mass exposure in the magazines, which attracted more shapers, which produced more consignment boards, which helped sell more surfboards. Things start to get a little hazy when boards with Lightning Bolt logos were being made and sold in other shops, in other cities and other countries. Star Bolts take the mystery one step further. 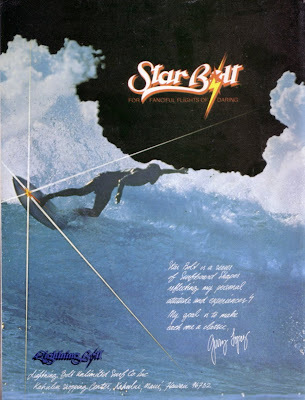 According to the ads posted here, Star Bolts were made by Lightning Bolt. 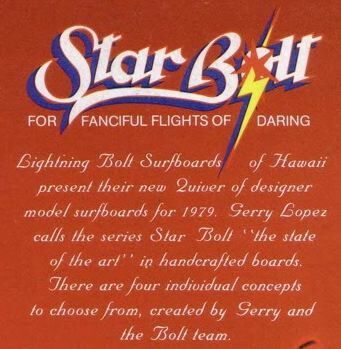 But at the end of the day, who was Lightning Bolt surfboards and why did they need to make Star Bolts in the first place? 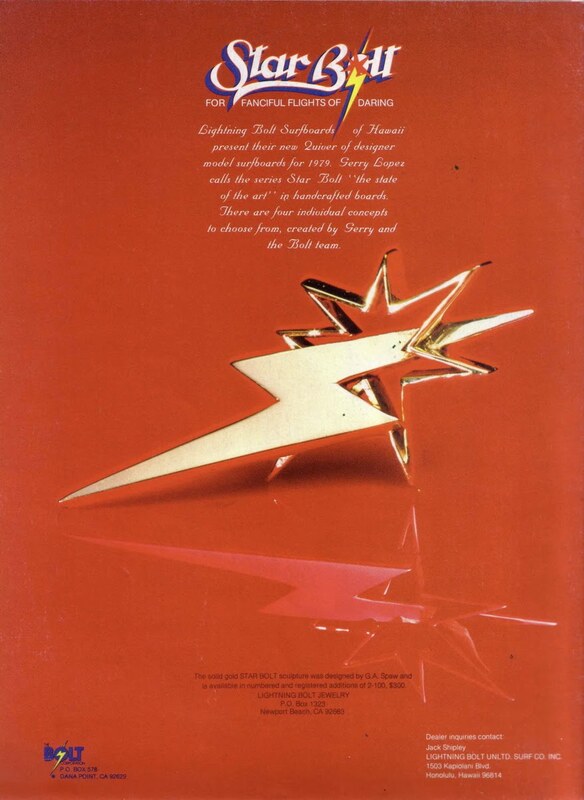 We know Gerry and Rory shaped Star Bolts, we know MR rode Star Bolts, but who is Star Bolt? 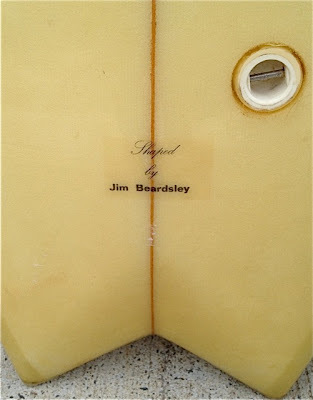 Jim Beardsley shaped Star Bolts in Australia as early as 78, judging by my board and the pics kindly shared with us by another Australian collector, whose example is almost identical to mine but in far, far better condition. 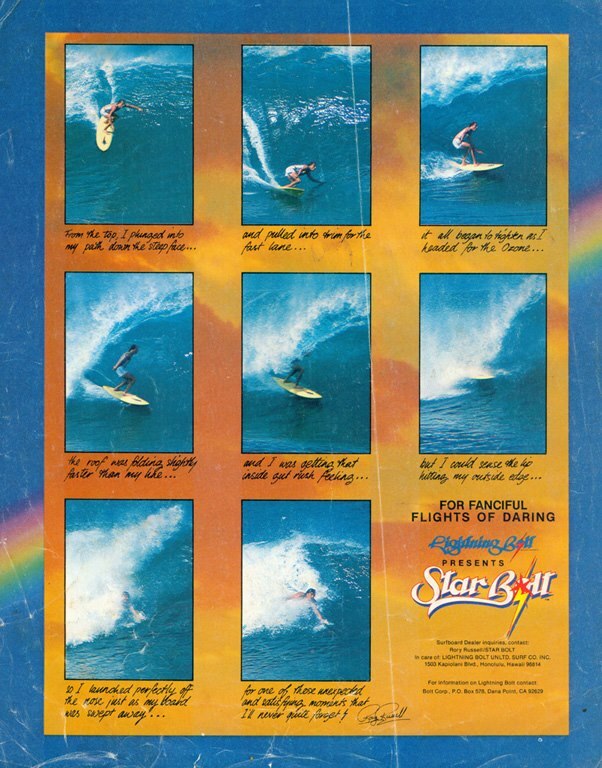 Did MR actually surf Jim Beardsley shaped Star Bolt twin fins? 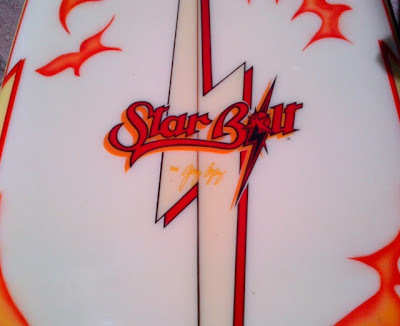 My Star Bolt, rough but nice. 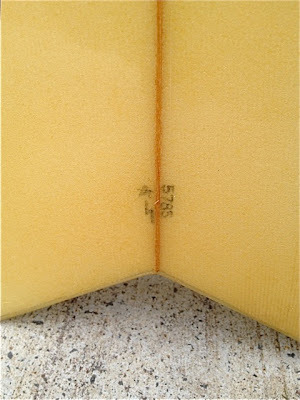 Mark from Surfboardline has very kindly shared these pics of his incredible Gerry Lopez shaped Star Bolt twin fin. 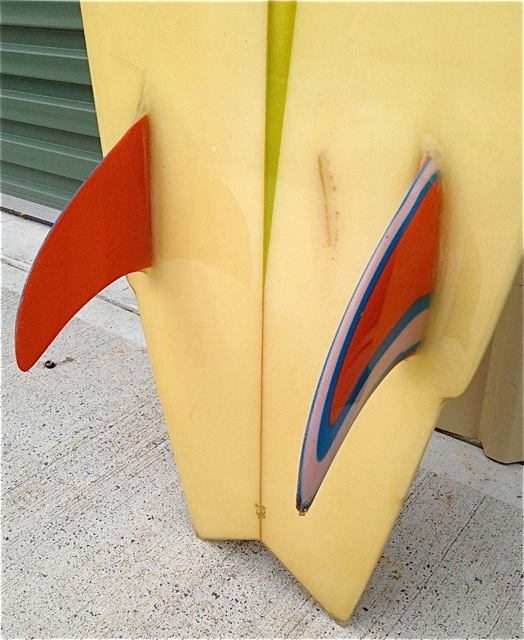 Incredible because it looks like a gun twin fin which makes it very rare. Its the only twin I've EVER seen shaped by Lopez. 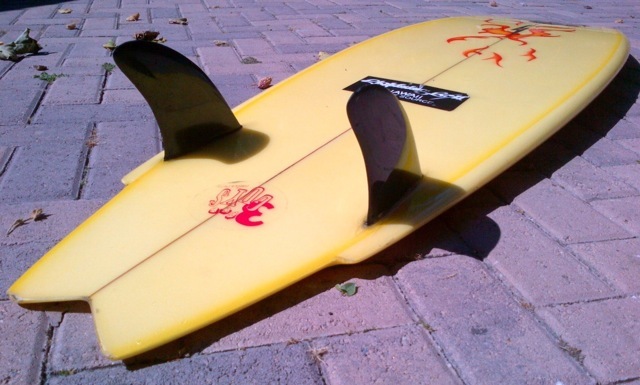 Now, if the Star Bolts were meant to be the premium line of Lightning Bolt surfboards, how do you explain this monstrosity I saw at the Patagonia surf Swap? What about my Australian Lightning Bolt twin fin? No Star Bolt decal, but it has the Star Bolt spray? You could e-mail Gerry. He lives here in Oregon and his website has an e-mail address. I've e-mailed about having a board built and got a friendly response back. If the shop operated on consignment, how were the bolts given away for free? Did the shop eat the cost and pay the shaper? Do you know how the shop was able to offer boards for free? Did the shaper get paid and the store eat the cost or,,,?